At The True Law Firm, we focus on family law and estate planning. We understand how important family is and how difficult family matters can be. We also understand that no two families are the same. That is why our goal is to develop a strategy and work towards an outcome that best fits your unique family needs. What does this mean? It means we get to know you, we explain the process and keep you informed every step of the way, and we take care of the legal issues so you can focus on the future. Send us a brief overview of your case and we'll respond as soon as possible. At The True Law Firm, we focus on family law and estate planning. We understand that the legal process can be stressful, especially when it involves family matters. That is why we are committed to helping clients through the process and arriving at the best possible outcome for you and your family. No two families are the same. Our goal is to get to know you and work towards a result that best fits you and protects your interests. Divorce does not have to be a long contentious process. If you and your spouse agree on all aspects of your divorce, an uncontested divorce may be right for you. When going through a divorce, it is crucial to protect your financial future. When a child is born to unmarried parents, steps must be taken to establish paternity and give the father parental rights. One of the most complicated parts of a divorce is the agreement between parents on how to work together to successfully raise their children. An expensive and stressful trial can be avoided if both parties can arrive at an agreement using a third party mediator. Things change. If you lose your job or the current time sharing agreement isn't working, a supplemental petition may be needed. If your ex-spouse is refusing to comply with the deal made in divorce, there are steps we can take to enforce the order. A will is a document that states your final wishes. It is read by a county court after your death, and the court makes sure that your final wishes are carried out. A power of attorney is a document that allows you to appoint a person or organization to manage your legal and financial matters if you become unable to do so. A living will is a written statement detailing a person's desires regarding their medical treatment in circumstances in which they are no longer able to express informed consent. A health care surrogate is someone who is appointed to make healthcare decisions for you when you become unable to make them for yourself. You won't find a better family law attorney! Andrea True is the founder of The True Law Firm, PLLC, a Gainesville law firm serving families throughout Alachua, Bradford, Clay, Duval, and Putnam counties. A Florida native, Andrea graduated from the University of Florida in 2012 with a Bachelor’s degree in Economics. Following graduation, she attended law school at the University of Richmond in Virginia, where she focused her studies in the area of family law. In 2015, Andrea was awarded the Family Law Award by the Virginia Bar for her work in the area of family law. 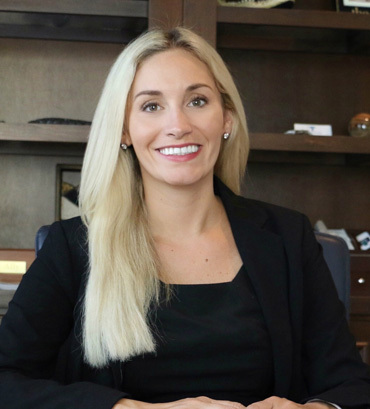 After graduation, Andrea moved back to Florida and was admitted to the Florida Bar in October 2015. Since then, she has continued to represent clients in all areas of family law. Andrea True is dedicated to providing her clients with individualized representation and zealously advocating for her clients best interest. When Andrea is out of the office, she enjoys spending time with her husband and two spoiled puppies. Andrea is also active in the local community and she is involved in the local chamber and bar association. This website has been prepared by The True Law Firm, PLLC for informational purposes only and does not constitute legal advice. The information is not provided in the course of an attorney-client relationship and is not intended to substitute for legal advice from an attorney licensed in your jurisdiction. The information contained in this website is provided only as general information, which may or may not reflect the most current legal developments. This website occasionally contains links to other web pages. The inclusion of such links, however, does not constitute referrals or endorsements of the linked entities. The True Law Firm, PLLC specifically disclaims any responsibility for positions taken by users in their individual cases or for any misunderstanding on the part of users of this website or any linked websites.The hiring of a lawyer is an important decision that should not be based solely upon advertisements. Before you decide, ask us to send you free, written information about our qualifications and experience.